Completion of 15 ICF constructed homes in March, Cambridgeshire was achieved early in April 2007. The development is a mixture of shared ownership for the social housing sector and properties for sale on the open market. Both 2 and 3 beds are available. It was the first Polarwall contract for the Northamptonshire based contractor who also specialises in civil engineering. Commercial Director Michael Tite, commented "the contract has allowed us to tie in the groundworks package with the Polarwall construction, making contract programming that much easier. The simplicity of the product is clearly evident which allows our workforce to quickly grasp the appropriate build techniques". The SmartLife project is a joint initiative between the Building Research Establishment (BRE), Cambridgeshire County Council and SmartLife. A total of 106 new homes are being built with three different Modern Methods of Construction. Polarwall was chosen from a number of different concrete building systems to build 15 of the new homes. 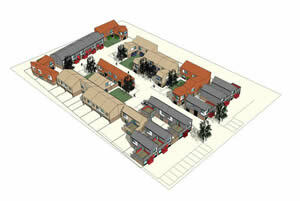 The remaining units are being shared with traditional block construction, steel and timber frame.